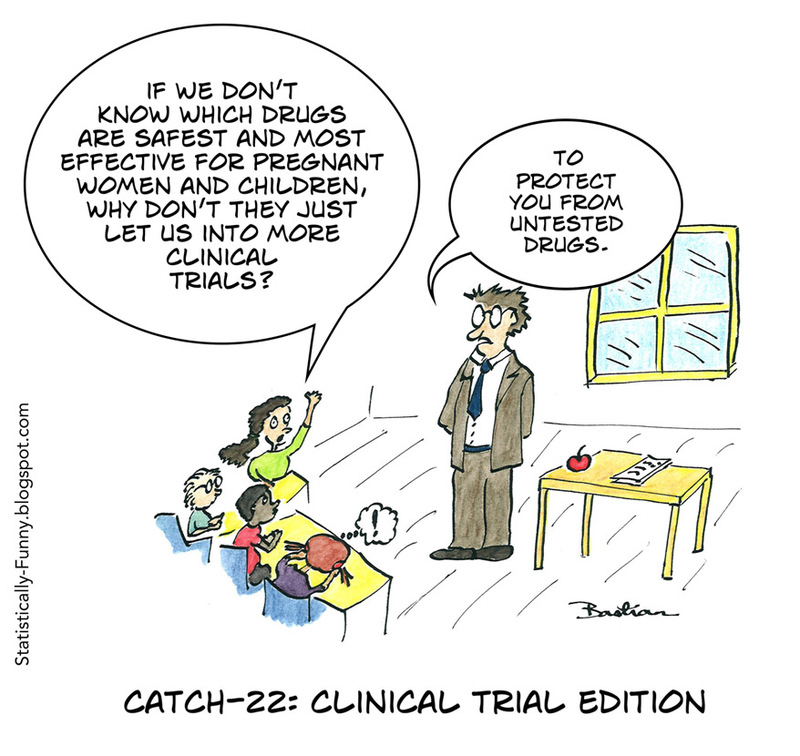 It's the Catch-22 of clinical trials: to protect pregnant women and children from the risks of untested drugs....we don't test drugs adequately for them. In the last few decades, we've been more concerned about the harms of research than of inadequately tested treatments for everyone, in fact. But for "vulnerable populations," like pregnant women and children, the default was to exclude them. And just in case any women might be, or might become, pregnant, it was often easier just to exclude us all from trials. It got so bad, that by the late 1990s, the FDA realized regulations and more for pregnant women - and women generally - had to change. The NIH (National Institutes of Health) took action too. And so few drugs had enough safety and efficacy information for children that, even in official circles, children were being called "therapeutic orphans." Action began on that, too. There is still a long way to go. But this month there was a sign that maybe times really are changing. The FDA approved Diclegis for nausea and vomiting in pregnancy. It's a new formulation of the key ingredients of Bendectin, the only other drug ever approved for that purpose in the USA. Nothing else has been shown to work. Thirty years ago, the manufacturer withdrew Bendectin from the market because it was too expensive to keep defending it in the courts. It's a gripping story, involving the media, activists, junk science and some fraud. It had a major influence on clinical research, public opinion and more. You can read more about it in my guest blog at Scientific American, Catch-22, clinical trial edition: the double bind for women and children. In dozens of court cases over Bendectin, judges and juries struggled with competing testimony about scientific evidence. In one hearing, a judge offered the unusual option of a "blue ribbon jury" or a "blue, blue ribbon jury": selecting only people who would be qualified to understand the complex testimony and issues of causation. The plaintiffs refused. Ultimately, in one of the Bendectin cases, Daubert versus Merrell Dow Pharmaceuticals, the Supreme Court re-defined the rules around scientific evidence for US courts. The previous Frye Rule called for consensus. The 1972 Federal Rules of Evidence said "all relevant evidence is admissible." The new Daubert standard determined that evidence must be "reliable" - grounded in "the methods and procedures of science" - not just relevant. We still need everyone involved to better understand what reliable scientific evidence on clinical effects really means, though. You can read more about that here at Statistically Funny. Think of the children? Forget it. A study of 18 maritime disasters by Mikael Elinder and Oscar Erixson from the University of Uppsala in 2012 (http://www.nek.uu.se/Pdf/wp20128.pdf) found that the survival rates were over 60% for the crew, just under 40% for male passengers, less than 20% for female passengers and even less for children (though data for children was limited). The captains' chance for survival was slightly higher than for male passengers. Passengers with first-class tickets did much better than those with second or third class. Sounds familiar? This makes me wonder what are the stats for droughts, earthquakes and other disasters. I wouldn't be surprised to find out that in such cases women and children have lowest chances too. The Bendectin story sounds fascinating! Going to check it out now. And I agree that it is a little ridiculous to "protect" women and children by refusing to figure out how drugs work in these populations.